The Libyan National Army (LNA), led by Field Marshal Khalifa Haftar, took control of the Yarmuk military camp south of Tripoli, a source in Haftar's General Command told Sputnik. "The forces of the Libyan [National] Army have gained control over the Yarmouk camp to the south of capital Tripoli," the source said. 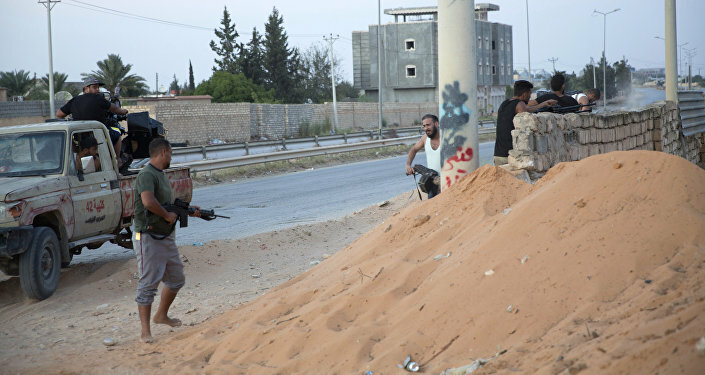 Last week, Haftar announced an offensive against Tripoli in a bid to oust "militias" from the city. On April 7, forces loyal to the GNA said that they were launching a counteroffensive operation, dubbed Volcano of Rage. Since the beginning of the offensive, the Libyan National Army, has already gained control over several cities near Tripoli and over Tripoli International Airport. The GNA later said that the airport had been retaken by its forces, but the LNA refuted the claims. LNA has declared a no-fly zone over the western parts of Libya, which are governed by the UN-backed Government of National Accord (GNA), and has warned that all aircraft, apart from commercial flights, that breach the restrictions will be targeted by the LNA, the forces' spokesman, Ahmed Al-Mismari, said. "We are implementing a #NoFlyZone over west #Libya, any military jet will be considered a target as well as its takeoff location. This includes Aerial photography and excludes commercial flights," the spokesman tweeted late on Sunday. As a result of a civil conflict which has lasted years, there is no single central government in Libya, and the country's eastern and western parts are controlled by separate powers. The Tobruk-based parliament, elected in 2014 and backed by the LNA, governs the east of Libya, while the Government of National Accord (GNA), established in 2015, controls Libya's western parts from Tripoli. In late 2015, the parties to the conflict signed a Libyan Political Agreement in the Moroccan city of Skhirat, outlining the creation of the GNA as the legitimate interim Libyan government. However, the deal was not fully implemented due to the eastern-based parliament's disagreement over some of its provisions.